AVILA BEACH, Calif. -- The Port San Luis Harbor District has issued a credible shark sighting warning after a Great White Shark was seen off the coast of Avila Beach Thursday afternoon. The district is placing signs on the beach warning potential swimmers of the sighting. The special advisory postings will remain in place until Sunday. "I'll definitely be keeping my eyes open and be aware," says Dean Fraley, who is visiting the area from Camarillo. It's pretty scary because you never know where they are going to be lurking." While keeping a close eye on his family kayaking, Fraley says he is not surprised to hear of the sighting. "It is getting warmer, they're coming out, they're curious, and they are hungry," he says. "It's a little scary," says Lauren Price, who has lived nearby for more than 20 years. "We come out here every weekend and throw sticks for our dog, and you don't want to hear that there's a great white shark out there," she says while admitting that it is simply part of living on the Central Coast. "They've been sharks here before, so it's just part of living on the coast." The signs will stay up for the next 72 hours. 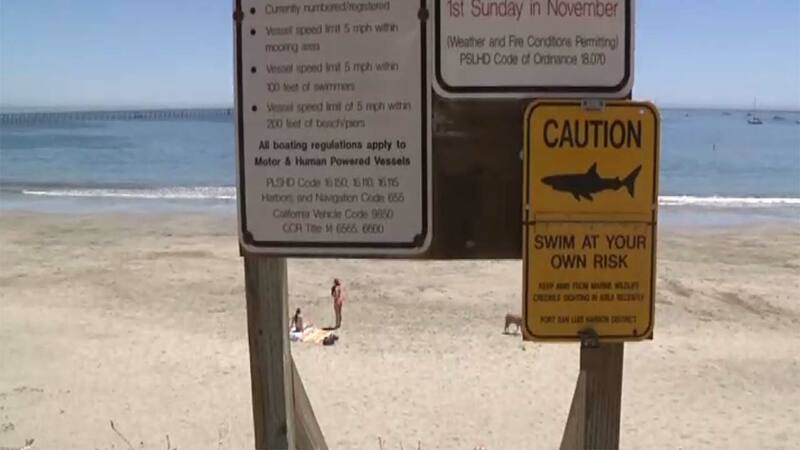 The last person to die from a shark attack in Avila Beach was in August 2003. Shark attacks remain extremely rare. According to the University of Florida's Shark Attack File, your chances of being attacked are 1 in 11.5 million. You are more likely to die from a dog attack, snake bite, or by hitting a deer with your car. With temperatures expected to stay warm through the weekend, Fraley has some last minute advice. "Be alert, be aware, be cautious, and go at your own risk."